In time for the 50th anniversary of the San Diego – Coronado Bridge, Caltrans has started making some much needed upgrades to the landscaping on the Coronado side where the bridge delivers vehicles into the Crown City, the Gateway to Coronado. At the recent Coronado Naval Complexes Coordinating Group Meeting, City Manager Blair King gave a presentation on the history and future of the Toll Plaza/Gateway Project. 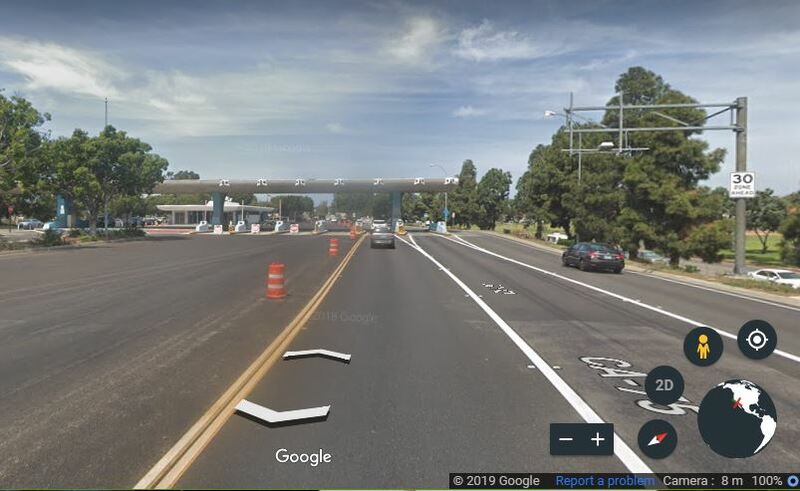 The city’s ongoing objective is to calm traffic and make the Gateway aesthetically attractive, but efforts in the past have been stalled because the toll plaza and bridge are under the jurisdiction of Caltrans. Most recent toll plaza gateway concept. The bridge was a pivotal point in the development of Coronado. History shows that the City of Coronado was not originally supportive, so the location was decided on by the City of San Diego and the Navy, who worked closely on the bridge from inception of the idea. A 200-foot clearance over the bay was incorporated to allow Navy and other ships to pass. From the time the bridge opened on August 3, 1969 until 2008, it was the longest continuous box girder bridge in the world. Initially a $.60 toll was collected in both directions. 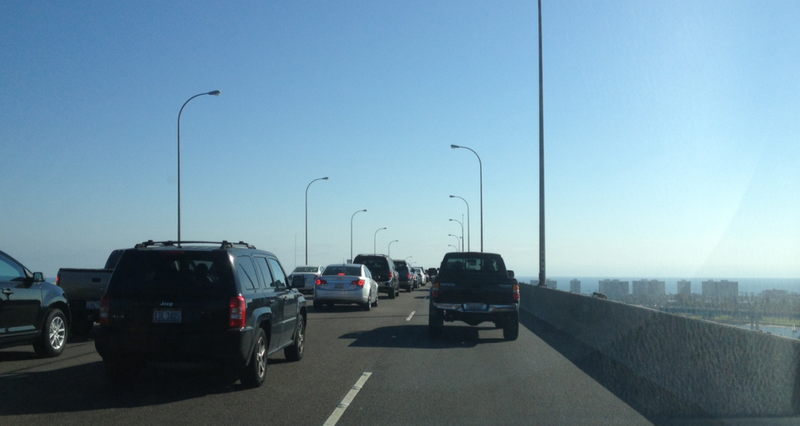 The toll was later changed to $1.00 for inbound traffic. The bonds for financing the bridge were paid off in 1986 and the tolls were removed on June 27, 2002. “When the tolls were removed, the number of lanes going through the toll plaza (inbound) was reduced to three to match the number of maximum inbound lanes on the bridge. The extra lanes that had been used for toll collection were no longer needed. 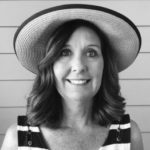 When SANDAG stopped the toll, the City of Coronado did not oppose the Environmental Impact Report (EIR) and got a $7 million settlement from toll revenues to be used for approaches to the bridges to improve traffic,” pointed out Ed Walton, City Engineer. King stated that it is not an easy task to figure out how to work with freeway-like traffic coming onto a neighborhood street. He reviewed the history of proposed projects throughout the years. A 2003 project study recommended a variety of calming measures, and the number of lanes were reduced by striping and delineation utilizing construction barrels. In 2010, a proposed tunnel project from the bridge to the Naval Base was abandoned. The following year, a concept was developed to calm traffic and beautify the toll plaza and $800,000 was allocated for these improvements. Public workshops were held with low participation, at which point the city council asked the city to seek more public input. In 2013, an updated conceptional plan was developed with an emphasis on traffic calming and operational needs with a revised plant palette. In 2014, all non-essential irrigation was turned off, due to the area wide drought. The Gateway Project was revisited again in 2016 with the focus remaining on traffic calming, safety, aesthetics, pedestrian crossing, and achievability. 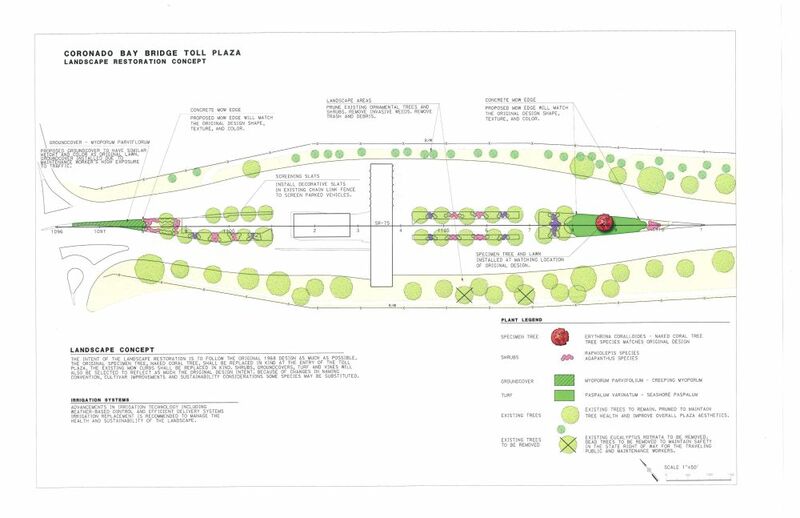 Three phases were proposed: early maintenance, gateway improvements, and a pedestrian tunnel. At this point, Caltrans indicated that permitting issues would be difficult, with the bridge eligible for historic designation at 50 years in age. Caltrans provided guidance on simplified improvement that could be made, and the plan was updated yet again. Previous proposal: conceptual image from December 2017. In June 2018, a new Gateway Signage and Maintenance Project was presented by Walton at the city council meeting. This project will potentially include removal of the overhead traffic sign, consistent painting on wing structure, repair of lighting and additional lighting on wing structure, shifting travel lanes to center, more defined lanes, getting rid of orange construction barrels, adding new landscape with the same palette, consistent with the historic theme. Caltrans is in the process of finalizing a landscaping plan and currently has irrigation upgrades underway. This project is scheduled to be completed before August 3, 2019, in time for the bridge’s 50th birthday. This is one of the first steps, and the project will continue to be refined and permitted to include additional traffic calming and beautification elements. 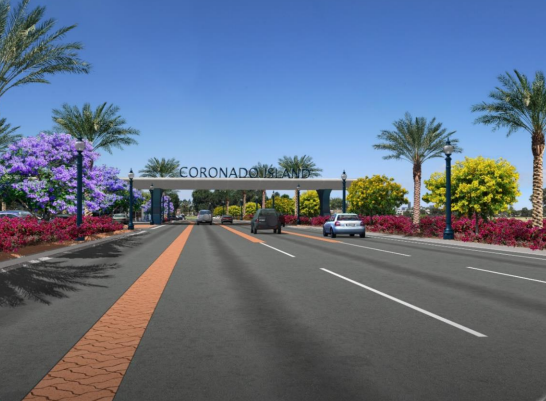 The city has funding and will continue to work with Caltrans to implement additional enhancements to improve the flow of traffic in both directions and create an aesthetically pleasing environment for the Gateway to Coronado. “Perseverance is going to be key for this project,“ said King.